How can we teach children about one of our most important natural resources? 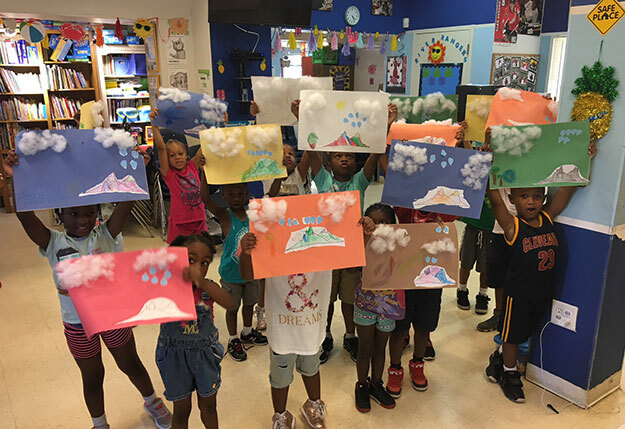 Gaynelle Diaz combines lots of reading with art, hands-on activities, and field trips to jumpstart a summer full of learning about water and our local rivers. 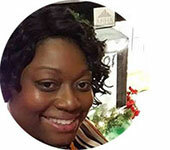 Gaynelle is the Center Coordinator at the Ruby Tucker Family Center, for the Alexandria Redevelopment and Housing Authority. As a young child, she discovered the joy of reading and would always hide a book and a flashlight under the covers before she went to bed. As an adult, she still loves to read, along with reading to kids and finding new ways to inspire the same love of reading in them. My name is Gaynelle and I run an 8-week summer camp for 4-6 year olds in Alexandria, VA. Every summer we do lots of reading with our kids and try to integrate our topics with field trips and other activities that we do in camp. 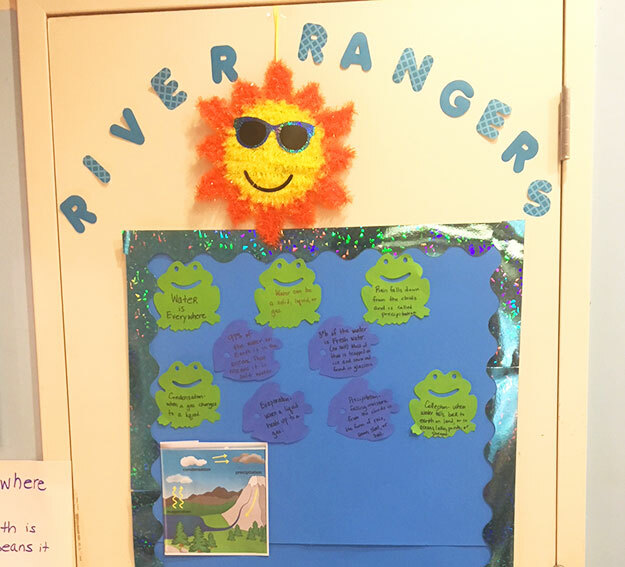 This year, we are super excited to have access to the River Rangers curriculum this summer and to use some of wonderful resources. Since I work with younger kids, I decided it would be best to give them some context before jumping in and discussing how rivers are formed. So, we started with The Water Cycle and just talking about water in general. I wanted to first get them to understand how much water is all over the Earth, that it can be salt water or fresh water, and that the same amount has been here for millions of years just going round and round. I made a board and found these little fish and frogs at the Dollar Store. As we read and learn facts, I write them on one of the fish or frogs and add them to the board. We also talked about the different forms of water and of course the states of water as it’s going through the cycle. I also made word lists to share. I have to say our favorite word of the week (and I think summer) is precipitation. It was pure joy to have a bunch of 4-6 year olds repeat that word and all the different pronunciations I got — pre-pi-pa-pa-ta-tion, par-ti-ci-pa-ta-tion — you get the drift, but they all know what it means, so we had a lot of fun with that word. Most of the books were on the suggested list in the curriculum, but a few I found at the local library and added in. The Water Princess was based on a true story of a little girl who lived in Africa and the daily trek she made with her mother to collect water. Some of the others were just nice storybooks that involved water, but I always made the connection back to our theme. We also made connections to our other activities and did a fun science experiment where we mixed salt with water, covered them with plastic wrap with a cup inside, and placed in a sunny window to make fresh water and illustrate the water cycle. 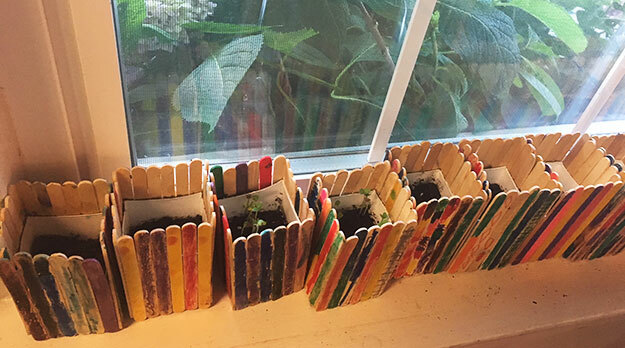 We also took our left over from milk cartons from lunch, added some decorative popsicle sticks on the outside and made little planters. We planted seeds and placed them in the window to watch them grow. Again, our connection was how much everything depended on water. Lastly, after we read one of the water cycle books — which had a really good illustration — we were inspired to have them recreate their own water cycle photos as another one of our art projects. They were super excited to take them home and explain how water goes round and round from the ground up to the clouds and back again. So, for our first week, we were able to do our reading activities, art, and science — all around water. In addition, we attended some shows at the local library and the Smithsonian’s Discover Theater about animals that live under the ocean and reptiles. We met Lil G — an American Alligator that was found in the DC area, and Carma Chameleon, who likes to change colors, an albino snake and a baby shark (both in a tank of course), frogs, and a host of creatures that the kids thought were super cool. 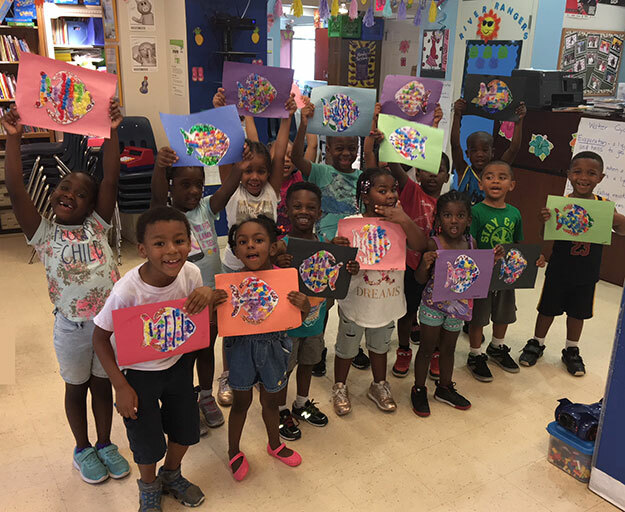 For their art project, they actually created their own Rainbow Fish, which looked like some of the fish they saw that lives under the sea. The last one was by far the most popular because it talks about animals that live by different bodies of water all over the U.S., it gives you the names of the baby animals, it involves counting and most importantly RHYMING. Since we now know about different animals and have learned some cool water words, we made a list and I let all the kids pick their River Rangers name. We put them on the River Rangers badges and added them to our board. Of course the first word to get picked as a River Ranger name was … wait for it … PRECIPITATION! 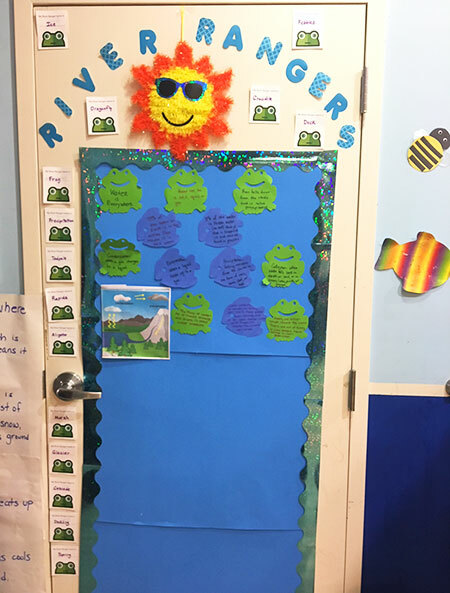 My Summer River Rangers are: Precipitation, Dragonfly, Crocodile, Pebbles, Duck, Duckling, Marsh, Glacier, Cascade, Spring, Frog, Tadpole, Rapids, Alligator, and Ice. As you can see, we have had a busy two and half weeks, but so much fun — and I hope to share more of our River Rangers adventures in the next few weeks.